Pool games are such a hit and miss affair (GEDDIT! HIT! MISS!) that often they simply fly under the radar for anyone other than devoted enthusiasts of the game. 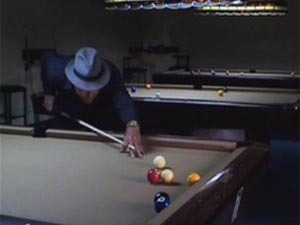 Let down by shoddy ball physics, pool titles are left to gather dust on shelves till they hit such a low price that some simpleton is bound to pick them up. 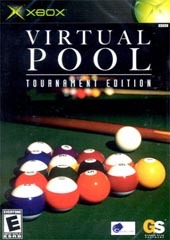 With this title all the usual gameplay options are there for those who love pool and want to get serious about it. For the rest of us, sorry but no quick game for you buddy! Set up of a profile is a must and whilst it certainly has a lot of features, there is no get in and out of a game quickly. In career mode you can work your way up and out of the garage to the luxury settings where the big money is. There is the addition of a cue shop where you can buy all important new cues to make those shots count. The intelligence of the opponents varies and provides a nice challenge although personality wise, there could have been slight improvement. There is no online aspect to the game which would have been fun to play against other people around the world and maybe a leaderboard of some type but it is not to be. The balls move nicely around the table and even leave it with a good degree of realism, play is fairly quick with the AI not too sloppy in providing decent competition. The main antagonist in the game Curly is not too overwhelming and his voice work, whilst meant to be intimidating falls a bit flat. 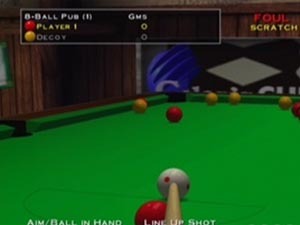 Graphics and Audio are pretty ordinary and what do you expect from a pool game? At the cut rate price this puppy will go out the doors at, you really have no right to complain! I think that the Xbox has potentially hit the point now that any game will make it through as they try to prepare punters for Xbox 360° and the great titles that they are going to unleash on the world with that amazing machine. It happened with the PS2 and is was bound to happen here as well, at least little kids will get more games. Recommended for pool enthusiasts only.